The relationship between the workers seen here and their towering creation took me to that place of amazement over what and how fast we build. 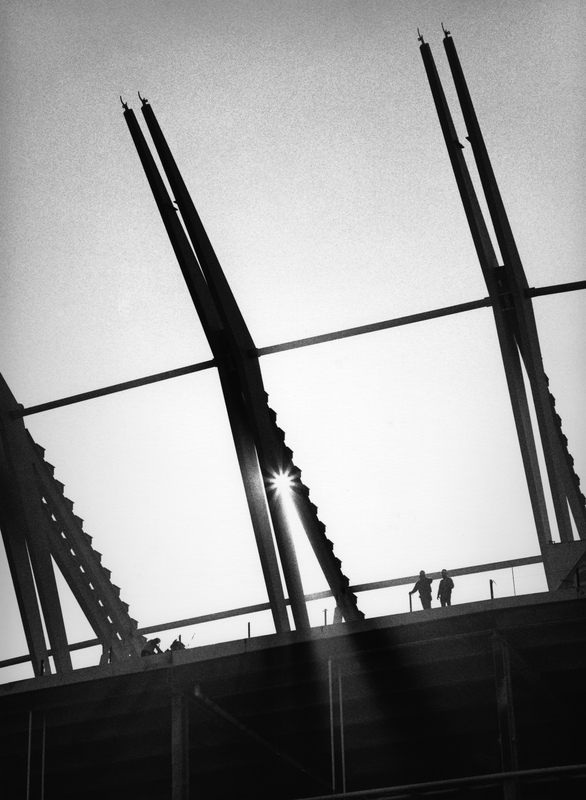 Prior to these steel structures being set in place, beams that would eventually support the bleacher seats in a football stadium, there were innumerable people involved—those with the vision and desire: geologists, engineers, architects, attorneys, politicians, bankers, investors and city planers. I think of the tonnage of paper documents, the multiple terabytes of information and images, the specification and sourcing of raw materials, contracts and the scheduling of contractors, all needing to be coordinated before the golden shovels could even break ground. Consistently I’m puzzled by how so few men can erect such enormous structures involving so many parts and heavy materials in such a short amount of time. How do they know where to move the dirt? I see conduits and all manner of PVC pipes sticking out of the mud without any indication where the walls will go—a testament to precise planning and measurement. How do builders determine structural stresses in advance? And how do they manage every aspect of the process so the structure will be plumb and sound? Another wonder is how supervisors manage to maintain teamwork, keeping multiple contractors on the same page, coordinating their activities in proper order? It seems to me that the building trades have arrived at, or are quickly moving toward, the realization that filmmakers enjoy, that is, whatever they can imagine, they can build. Pondering the notion of vision and realization, I think of the causal relationship between mind and matter, thought and form. I think about the great engineering feats: the Giza pyramids, the Great Wall of China, Teotihuacan in Mexico, the Panama Canal, the Manhattan Project, the Apollo missions, the Palm Islands in Dubai, the International Space Station. They all began with a vision—honor the gods, solve a problem, end a war, explore the cosmos, build a nation or fill a need like the U.S. Interstate Highway system does. It’s easy to acknowledge that mind has accomplished great things. On the other hand, is the vision of something possible reason enough to create it? Just because we can envision a weapon, drug or deadly virus, should we produce it? As technologies advance the ethical questions compound exponentially. Excitement over discoveries can overshadow the consideration of consequences. Indeed, we tend to create what we can imagine, personally and socially. I look around my room. I can’t identify even one object that was not first a thought or influenced by thought. Look out your window. Is there anything there that was not first a thought or influenced by thought? The only thing that comes to mind for me are clouds. Not the garden. Not the trees that were planted, moved or modified in some way. Not even the rain drops that left acid stains on my car. Wait. Not the clouds either. 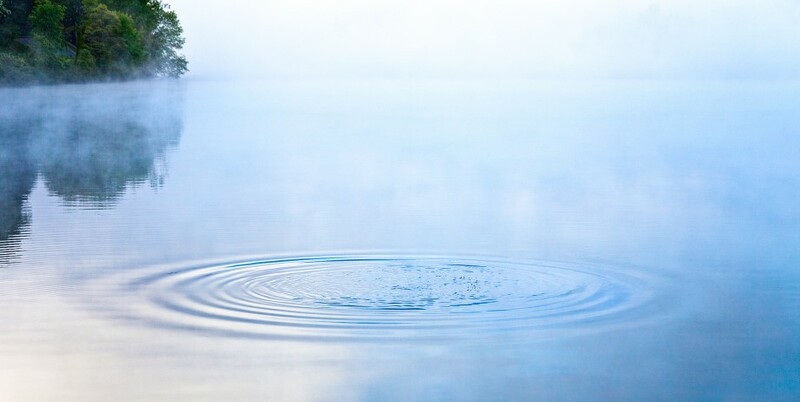 In addition to water vapor, they’re composed of a myriad of man-made compounds, aerosols and particulate matter, all the residue of thought-produced products and processes. Is there anything anywhere on the planet that was not first a thought or influenced by thought? What about insects, birds and animals? Consider how human beings have influenced their evolution and migrations. The moon bears our imprint, as does the bottom of the ocean. Might the deep ice at the poles, magma and the worms growing around oceanic hydrothermal vents be exceptions? What about the planet itself? The solar system? The Milky Way galaxy? I personally believe that consciousness does indeed permeate the universe, that the universe proceeds intelligently in its evolution and must therefore be conscious… Consciousness is inherent in every level of the universal holarchy by logical argument. I’m always on the lookout for construction sites. Small or large, they’re a ready source of aesthetic elements—exquisite light, geometries, textures, surfaces, tonalities and evidence of human activity. Although permissions are necessary in many instances, it’s worth asking. Recently I was shooting through a fence when a man wearing a hardhat drove up in a golf cart. I explained how I was just shooting for my own creative purposes and asked who I needed to talk to for permission to go beyond the fence. Turned out he was the lead contractor on this enormous site and he invited me to hop in his cart. He gave me a hat and drove me all around the site, an hour-long tour of what was to become a twenty-story office tower and retail mall. Regarding this particular image, I drove downtown without anything in particular in mind. I just wanted to shoot some black & white film. The camera I use for hand-held, spontaneous shooting is a 2 1/4 square Bronica. I’d been out a while, shooting mostly the contours of expressway ramps under construction. I was about to quit when I realized that I would be getting into rushhour traffic, so I decided to stay. A new football stadium was being built on the riverfront, so I made a turn and went down a dirt road behind a truck heading in that direction. The road wasn’t open to the public, so when I passed through the gates my intention was to ask permission when I got closer. Having arrived near or after quitting time, there wasn’t anyone to ask. So I drove alongside the steep walls of the stadium looking for a shot. Neither the steel beams nor anything else called out to me, so I turned around and was well down the road when I heard a loud noise. In the rear-view mirror I saw the truck dumping a heap of dirt at the base of the structure and dust was billowing way up, causing shafts of sunlight to pierce through it. Seeing that there were no cars on the roadway, I grabbed the camera and got out of the car leaving the door wide open and the engine running. As I approached the structure I saw the sun flare, so I moved around to maximize its brightness and position it between the struts. The dust was settling fast, so I clicked off exposures as I went. Amazingly, gratefully, some workers appeared atop the structure at just the right moment. This entry was posted in Uncategorized and tagged Aesthetic, builders, consciousness, consequences, construction, Film, realization, technology, Universe, vision. Bookmark the permalink.